IPL laser hair removal treatment beams laser onto the roots of your hair on your skin. It stings as if a rubber band snapping onto your skin. Maris Gina's SHR hair removal system's light beam is a softer light that concentrates on a wider span of your skin, allowing us to feel less pain and just warmth. With Maris Gina SHR hair removal, it is hardly painful. It uses a special light that reacts only on hair, therefore all we can feel is warmness. By this, we are able to remove hair stress-free. Till now, we had to arrange a treatment every 2-3 months depending on your "hair cycle" according to hair growth. Maris Gina's SHR treatment, treatment can be done with a 1 month interval. The speed of the treatment allows 1000 hair to be removed in 10 seconds, leaving a total of about 20min for the entire service. IPL laser treatment till now, only reacted to "black". Maris Gina's SHR hair removal reacts not only to black hair, but the hair follicle. Therefore, treatment can be done thoroughly for darker skin tones and tanned skin without damage. Baby hair is also treated. 1. Please come to the salon after you have shaved the area you want to be treated! 2. We will apply cold gel in order to protect your skin and for the machine to move smoothly on your skin. 3. The machine will run gently on your same area two times. 4. A cold towel will be placed on the area that is treated. 5. Lastly, we will apply moisturising lotion on your skin. In about a week, you will see your hair fall off. It will take about 6-10 times for your skin to be completely hair-free. However, treatment can be done every 3 weeks, meaning hair-free skin can be completed in 6 months at the shortest! Have you heard that SHR hair removal has become very popular? You may wonder if it's right for you. So, we will tell you WHO the SHR is suitable to! Yes, the SHR hair removal is very speedy. Those who are busy with work may not be able to keep coming back for a follow up session. We cannot say the treatment is cheap, but therefore it is considered the best. There must be many of you that want smooth, hairless skin right before your wedding, your travels, or to the beach! So the SHR is suitable for those that want to get beautiful skin, fast. We recommend the SHR hair removal to those that are tanned or with freckled skin. All the previous laser hair removals targeted the melanin of the hair. So, naturally, it reacted to blemishes and moles, causing unnecessary damage and pain. The SHR does not react to melanin, so it is recommended to those with all skin types. You may want hair removal, but feel a bit hesitant to make the first step. You may have heard that it is painful and damaging to the skin. We have noticed a lot questions on the internet regarding the pain. The new and innovated SHR has completely reduced the pain of hair removal. It is merely like a warm stone being placed on your body. We greatly recommend the SHR to those who wish a pain-free treatment. Maris Gina Salon services includes waxing treatment and the latest technique of SHR laser hair removal. 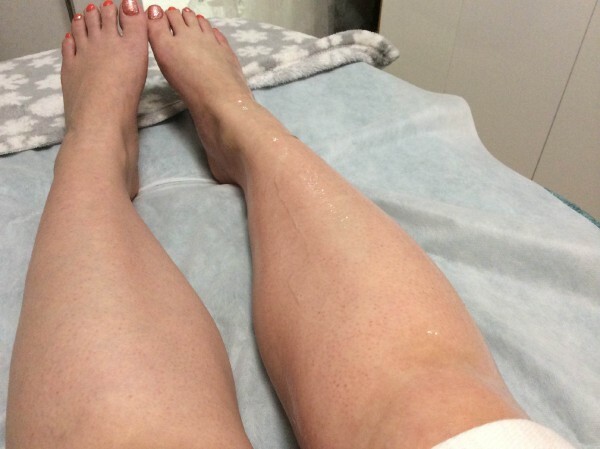 The SHR laser hair removal technique is very gentle to the skin. The laser does not damage the pores like many other techniques, but rather covers the hair follicle with heat, leaving a painless result. Additionally, the SHR laser treatment does not depend on the hair cycle, allowing treatment to be done every 3 weeks. A complete hair removal can be achieved in 6 months earliest. 5 beams of laser light hits the skin per second, and Maris Gina is committed to serve our customers gently and carefully. We always keep in mind the reason why our customers chose us. Maris Gina will keep serving our customers with precise, reasonable, and caring manner that is guaranteed to satisfy you.